There are more different types, sizes, and brands of computers at CES than you can shake a stick at, though Apple is always conspicuously absent. In fact the Apple Tablet somewhat overshadowed much of the innovations of the Las Vegas show because clearly the Apple Tablet is going to be the “one to beat”, especially given the lack of any clearly “superb” tablet offering at CES. Although I have not done enough research to generalize much about the best new PCs I think it’s clear that the mainsteam trend is towards smaller laptops and netbooks with robust features. Costs are going down – features that would have been unheard of at any cost 5 years ago are now standard on even a modest PC. Battery life is impressive and getting better – one of the ASUS PCs shown here had a battery that lasted something like 10 hours. ASUS also has a new interesting line of *very large* laptops with high quality speakers built into the sides of the chassis to the left and right of the screen. Although heavy, these will offer huge power and a “desktop” feel for your mobile computing. Still, I think weight is the key factor driving down PC size and predict it’ll be the netbooks that dominate the market for the next few years. Laptop Magazine looked at several of the new 10″ Netbook computers and has a nice write up of models from ASUS, Aspire, HP, Lenovo, MSI, and Samsung. The ASUS and Aspire appear to be their favorites when all factors are considered but if you are in the market for a netbook you’ll want to read these and other reviews. Happily for consumers if not for the industry at large, price in this category does not appear to correlate all that well with features and quality. John and I are prowling the floors at CES 2009 this afternoon and we’ve managed to bump into some interesting technologies as well as more than a few clever marketing pitches. The Hoover Reports economic analyst folks have a great looking Robot roaming the floors, but it turned out it is controlled by a human operator standing nearby and appears to have no to very limited autonomy. One of last year’s incredible technologies was the Darpa Autonomous Vehicle which drives itself, dodging pedestrians and traffic based on the software with no human control – not sure if Darpa is here this year or not. A vehicle technology that really impressed us today was the Simcraft full motion simulator. John tested it out and we’ll have pictures soon, but Simcraft’s simulator offers 3 degrees of freedom thanks to a strong steel frame system combined with electric servo motors. Three monitors on the front provide a wrap around visual of the track and John was very impressed with the realism. At $44,000 this is not the best Anniversary gift for your wife but for the very high end consumer market and (I think far more importantly) military and training markets this represents a lot of potential cost savings over real vehicles. We spoke with Simcraft’s CTO Sean MacDonald who indicated they are now working with Dept of Defense on training projects for combat vehicles. More and pictures later…. 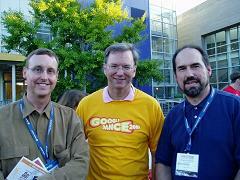 * Netbook mania! After seeing Lenovo and ASUS’ offerings I’d have to give ASUS very, very high marks so far. 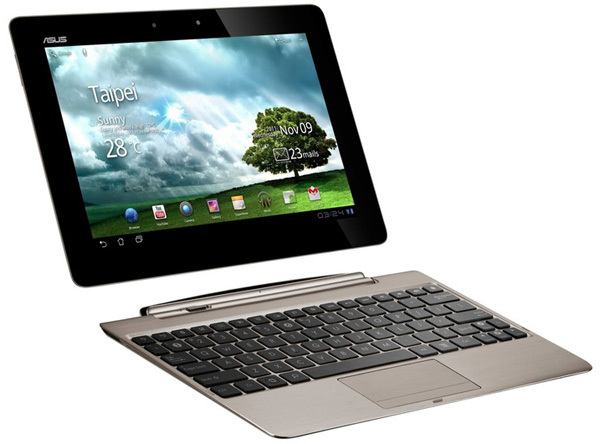 The new tablet PC, out in March, is a brilliant combination of form and function. Swivelling from netbook to tablet, the unit will offer built in GIS navigation such that you can flip the screen, mount it on your dash for a mega sized GIS unit. I think the cost he quoted was only about 500 for this very impressive fall format PC which will be robust in terms of specs but very mobile and light. 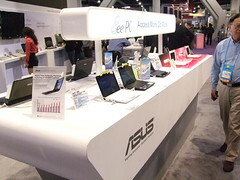 So far for me ASUS is the company to beat here at CES. * Samsung super brite displays. For me this was the showstopper in terms of visual appeal. Samsung’s display won an innovation award for their massive flat panel which has a static constrast ration of 2000 and super bright back lighting for brilliant color even in daytime. * Phoenix bios + operating system. Hey, who needs a clunky old OS like VIsta when you can simply pull up a browser and be in the cloud emailing, blogging, and working? Phoenix has a new product that basically replaces conventional OS with a browser. At Matt Cutts recently noted ne as well as many of us are spending the overwhelming majority of our time within the browser, raising the question of what we need a big fat OS for anyway.